Acepromazine is one of the top tranquilizer and neuroleptic agents for dogs, cats, and horses. With administration directions from your veterinarian, you can use this medicine for a variety of problems that your pet may have. Acepromazine (generic of PromAce) has many uses, and doctors often prescribe it with other drugs. It is most often used to calm or sedate aggressive or nervous animals. The medicine is also administered by veterinary surgeons as a preanesthetic to depress the pet's central nervous system and to drop the animal's blood pressure. Acepromazine's anitarrhythmic properties also work to stabilize the pet's heart rate. It is even used as an antihistamine, reducing itching, scratching, and other allergy-related symptoms. 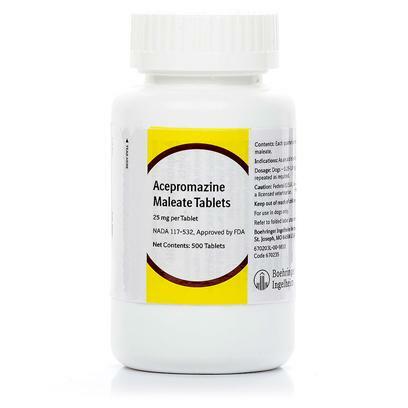 Acepromazine is the generic alternative to PromAce. The depression of the central nervous system can cause sedation, depression, lack of coordination, low blood pressure, slower heart rate and breathing; there have been instances of profound hypotension (low blood pressure), bradycardia, and collapse in individual animals. In some cases, the opposite may occur, and uses of acepromazine may trigger aggression and hyperactivity. Acepromazine also displays anti-cholinergic and alpha-adrenergic blocking properties, and affects thermoregulation, possibly leading to either hypothermia or hyperthermia. In rare cases, penile paralysis can occur in horses administered acepromazine. Pale gums are a recognized side effect, and as with any phenothiazine, this medication may color the urine pink. Due to its effect on heart rate, acepromazine is not recommended for geriatric animals or those in a weakened state. Some studies suggest that the boxer breed of dog is particularly sensitive, though this has been rebutted as well. It is recommended that acepromazine be used cautiously in sighthounds, and in animals prone to seizures. Acepromazine is administered intramuscularly, intravenously, or orally. It is most effective if given when the animal is not stimulated or excited. When provided for horses in the treatment of exertional rhabdomyolysis, acepromazine is often supported by the use of an IV. Use as directed by your veterinarian.